· Stunning 925 Chains （random）. · Certified Sterling Silver. · Latest Designs. Lovely Sparkly Teardrop, marked 925 on a good quality 925 marked chain. HOWEVER, WE HAVE MADE AN EXCEPTION TO ALLOW YOU TO INSPECT THE EARRINGS PRIOR TO DECIDING TO KEEP THEM. THEY ARE SENT TO YOU IN A CLEAR HYGIENE BAG WHICH IS SEALED WITH A HOLOGRAPHIC TAMPER PROOF LABEL. Peridot Quartz Necklace. Gemstone: Peridot Quartz. At Ishaq Gems, you can find the perfect Gift. A Necklace from Us will keep You smiling, especially when You see our way of Gift wrapping. Finish: Sterling Silver. A stunning unique Gift. You will not find this anywhere else. This necklace is made from Fine Sterling Silver and Simulated Raw Sapphire Gemstones. Designed to go with any outfit. Gemstone: Raw Simulated Sapphire. New in box RRP 60.00. I bought it and never worn it. Nice sized stone. Metal: Multi-Tone GoldStyle: ChainLength: 18 - 19.99"
BEAUTIFUL DOLPHIN PENDANT. WITH CUBIC ZIRCONIA / SIMULATED DIAMOND. 9 CARAT 375 YELLOW GOLD. Superb quality heavy and solid 925 sterling silver toggle style necklace with chunky tight belcher style links and a solid silver heart charm smothered in cubic stones. 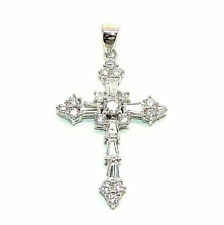 This is a superior made piece, made with fine quality of silver and to a excellent high standard. Great Necklace For Party Season. Nice Across Neckline. Box Chain Length 37cms Plus 5cm Extender Chain. CZs Size 1mm. Weight 11gms. THIS IS A HALLMARKED 9CT YELLOW GOLD CHAIN. HOWEVER, WE HAVE MADE AN EXCEPTION TO ALLOW YOU TO INSPECT THE EARRINGS PRIOR TO DECIDING TO KEEP THEM. THEY ARE SENT TO YOU IN A CLEAR HYGIENE BAG WHICH IS SEALED WITH A HOLOGRAPHIC TAMPER PROOF LABEL. 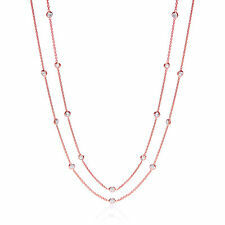 Your chance to own a stunning new 'J JAZ' Giovanna 9ct Rose Gold Plated Silver 925 Cubic Zirconia Stones Chain Necklace. "J Jaz fills a gap in the market for high quality jewellery that is original and contemporary which will add luxury and glamour to your lifestyle. Metal: Rose Gold PlatedStyle: ChainLength: 18 - 19.99"
✔JAYNES GEMS . 22CT TANZANITE SILVER +FREE 20 INCH CHAIN UK. Your chance to own a stunning new 'J JAZ' Giovanna 9ct Gold Plated Silver 925 Cubic Zirconia Stones Chain Necklace. "J Jaz fills a gap in the market for high quality jewellery that is original and contemporary which will add luxury and glamour to your lifestyle. Metal: Yellow Gold PlatedStyle: ChainLength: 18 - 19.99"
"J Jaz fills a gap in the market for high quality jewellery that is original and contemporary which will add luxury and glamour to your lifestyle. Your chance to own a stunning new 'J JAZ' Jeanne Sterling Silver Cubic Zirconia Crystal Stones Chain Necklace. "J Jaz fills a gap in the market for high quality jewellery that is original and contemporary which will add luxury and glamour to your lifestyle. Your chance to own a stunning new 'J JAZ' 9ct Rose Gold Plated Silver 925 Cubic Zirconia Chain Necklace. Metal: Rose Gold PlatedStyle: ChainLength: Over 35"
Your chance to own a stunning new 'J JAZ' Giovanna Ruthenium Plated Silver 925 Cubic Zirconia Crystal Stones Chain Necklace. "J Jaz fills a gap in the market for high quality jewellery that is original and contemporary which will add luxury and glamour to your lifestyle. "J Jaz fills a gap in the market for high quality jewellery that is original and contemporary which will add luxury and glamour to your lifestyle. J JAZ ♦ Gianna ♦ 9ct Rose Gold Plated Silver 925 Cubic Zirconia Stones Chain Necklace. Your chance to own a stunning new 'J JAZ' Giovanna Sterling Silver Cubic Zirconia Crystal Stones Chain Necklace. "J Jaz fills a gap in the market for high quality jewellery that is original and contemporary which will add luxury and glamour to your lifestyle. Sterling Silver pure 925 Necklace. "J Jaz fills a gap in the market for high quality jewellery that is original and contemporary which will add luxury and glamour to your lifestyle. "J Jaz fills a gap in the market for high quality jewellery that is original and contemporary which will add luxury and glamour to your lifestyle. Your chance to own a stunning new 'J JAZ' 9ct Gold Plated Silver 925 Cubic Zirconia Chain Necklace. Metal: Yellow Gold PlatedStyle: ChainLength: Over 35"
"J Jaz fills a gap in the market for high quality jewellery that is original and contemporary which will add luxury and glamour to your lifestyle. Your chance to own a stunning new 'J JAZ' Giovanna 9ct Rose Gold Plated Silver 925 Cubic Zirconia Stones Chain Necklace. Metal: Rose Gold PlatedStyle: ChainLength: 16 - 17.99"
Your chance to own a stunning new 'J JAZ' Giovanna Ruthenium Plated Silver 925 Cubic Zirconia Crystal Chain Necklace. "J Jaz fills a gap in the market for high quality jewellery that is original and contemporary which will add luxury and glamour to your lifestyle. (Gemstone Type : Simulated Diamond. We also have a range of other services including ring engraving, jewellery cleaning, gold and silver restoration and valuation services. st Classed Signed For). Est. delivery dateEst. delivery Wed, Apr 24Metal: Yellow GoldStyle: ChainLength: 16 - 17.99"
A beautiful happy graduation gift, a Sterling Silver New York Spiral Pendant. • 925 Sterling Silver. Exquisite Italian 18ct white gold filled simulated Heart gemstone necklace. 18ct Gold Filled. 9ct Gold Filled 22 mm x 11 mm. This ensures that the item is traceable. Stunning Sterling Silver Necklace. Stunning silver necklace. The piece is marked as 925 silver. Sold as seen in the images. We chose not to clean our pieces. Taxco 925 Sterling Silver Chain Necklace w/8mm Cat's Eye Beads. 38g, 50cm, 19.7"